5 Bdrm Detached Dwellhouse. Ground flr: V/bule. Reception hall. Lounge. Snug/Bar. Bdrm/Dining rm. Cloakrm with wc. Dining kitch/Family rm. Utility rm. 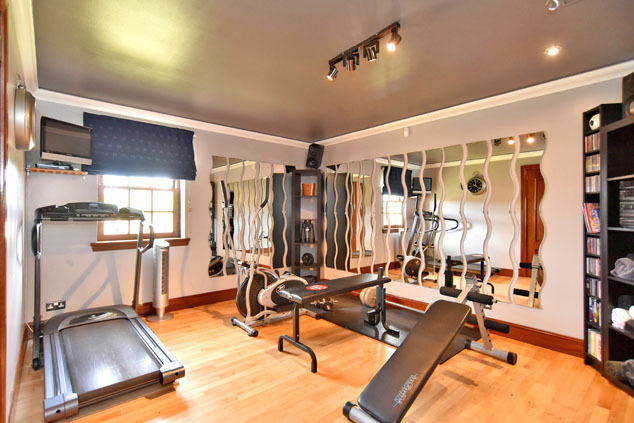 Bdrm/Gymnasium with ensuite. 1st flr: 3 Bdrms 2 with ensuite. Bathrm. 1.4 acre field (CT band - G). Garden. Double Garage. Parking. Price over £450,000 Entry by arr. Viewing 07743 013725 or contact solicitors. (EPC band - D). 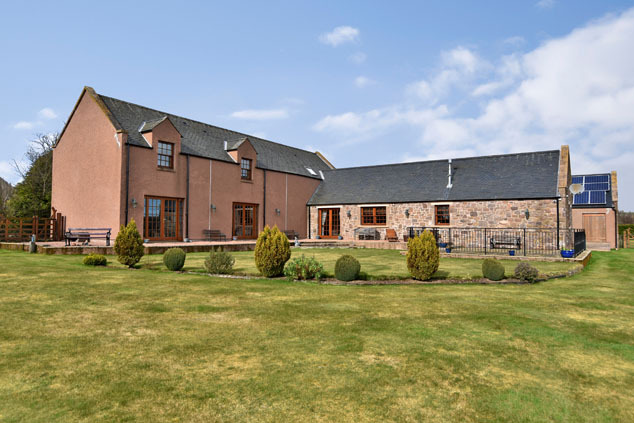 Boasting lovely views of the surrounding countryside, we are delighted to offer for sale this four/five bedroomed detached dwelling with large double garage which has been individually designed to utilise the traditional stonework from the original farm building. 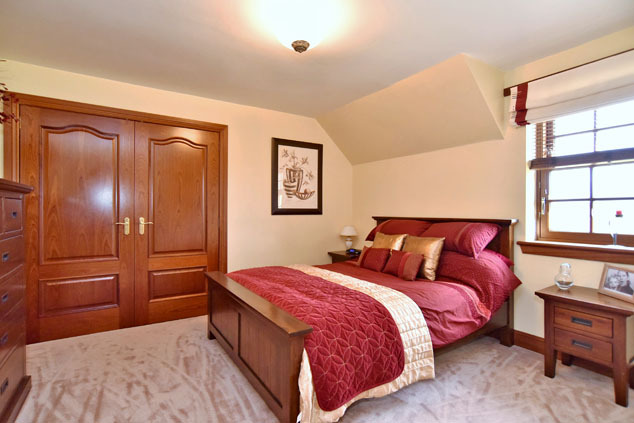 Many of the rooms have solid oak flooring along with Sapele wood internal doors, skirtings, sliding sash effect windows and a feature wooden staircase to the upper accommodation. The property also benefits from full wall insulation. Entry is gained through large wooden French doors with glazed side panels into a bright vestibule which continues into the spacious hallway through a further set of wooden French doors. The hallway features a lovely open tread solid oak staircase with wooden balustrade which leads to the upper accommodation. From the hallway access is given to the spacious dual aspect lounge with French doors leading out to the large pebbled area within the enclosed rear garden and benefits from beautiful views of the surrounding countryside. A glass panelled door leads through from the lounge to the snug/bar which, again, features wooden French doors to the rear patio area making the most of the lovely views. A large versatile dining room is accessed from the hallway which could easily be utilised as a bedroom. 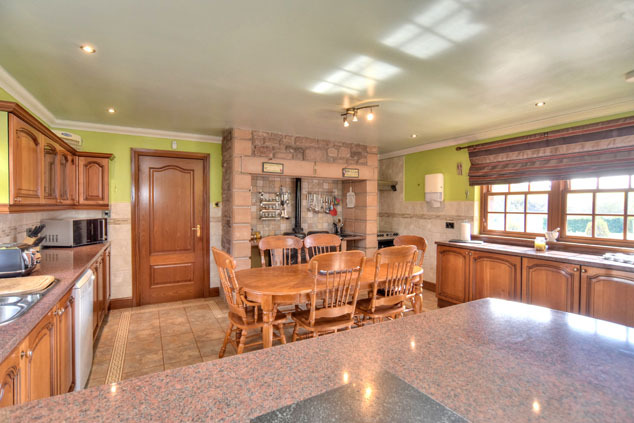 The fully fitted dual aspect kitchen is also a feature of the property with an AGA cooker built into a traditional stone surround adding charm to the room. 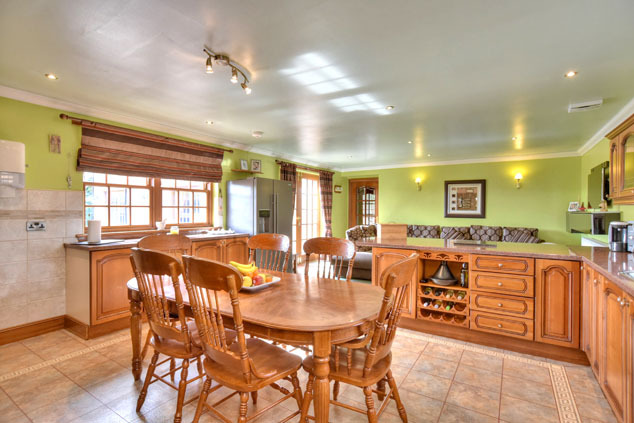 There is space within the kitchen which can be used as an additional family or dining area. 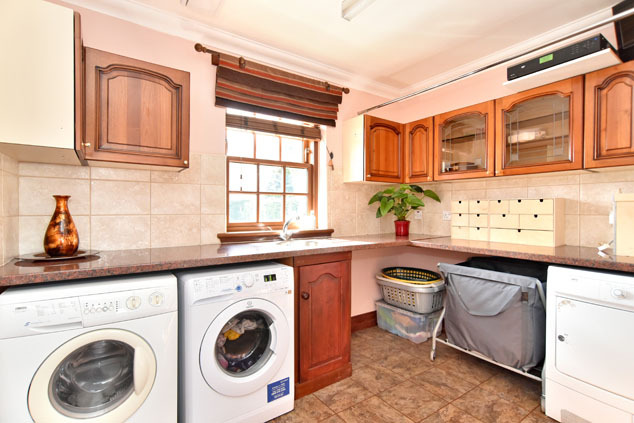 There is a useful utility room with ample storage and plumbing for further appliances. 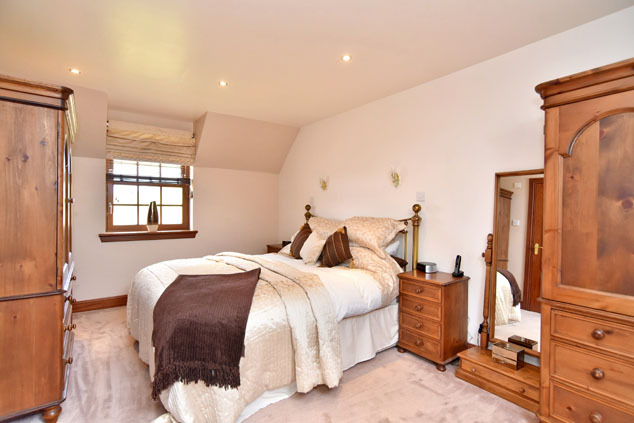 A further bedroom currently used as a gymnasium leads off the utility room and benefits from an en suite shower room. There is also an access hatch to the fully floored loft above which is currently utilised as an office and wardrobe space. The upper floor, filled with natural light from velux windows and sliding sash effect windows, includes an extensive landing area and passageway to the remaining spacious double bedrooms, two with en suite shower rooms and family bathroom with beautiful roll top cast iron bath. Outside, there is an extensive driveway with detached double garage featuring an inspection pit, solar roof panels and electric up and over doors. There is also a fully floored insulated loft above with power. The fully enclosed landscaped garden to the rear incorporates a lovely flagstone patio area with wrought iron balustrade and tasteful lighting. There is a further pebbled patio and extensive area of lawn with an embankment planted with small shrubs and a small stream belonging to the property runs alongside this. 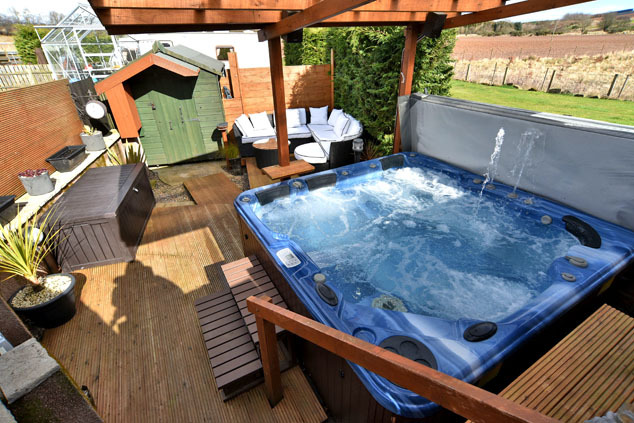 An additional secluded decked area fenced off to the side of the property features a hot tub and wooden shed. 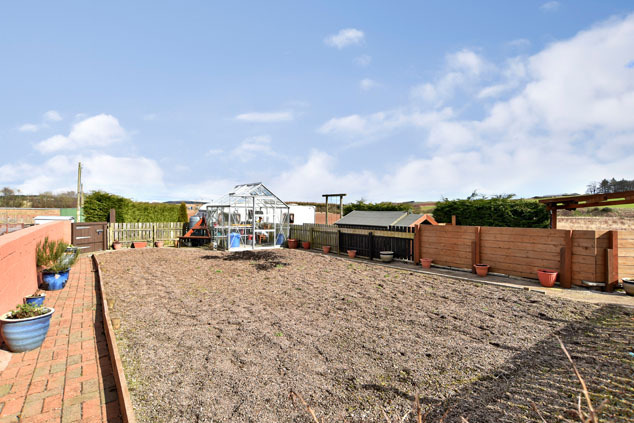 An enclosed area lies adjacent to this which includes a greenhouse and vegetable patch with additional storage sheds. 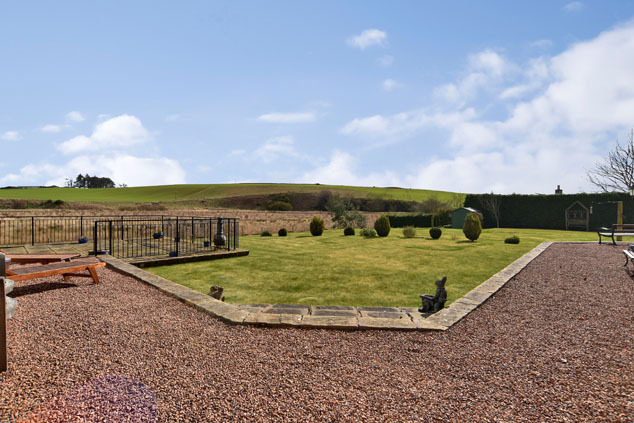 A second private driveway leads past the separate field of 1.40 acres approx. With the proper consents this property could lend itself to being set up as a bed and breakfast. Viewing is highly recommended to appreciate this unique property and extensive grounds. 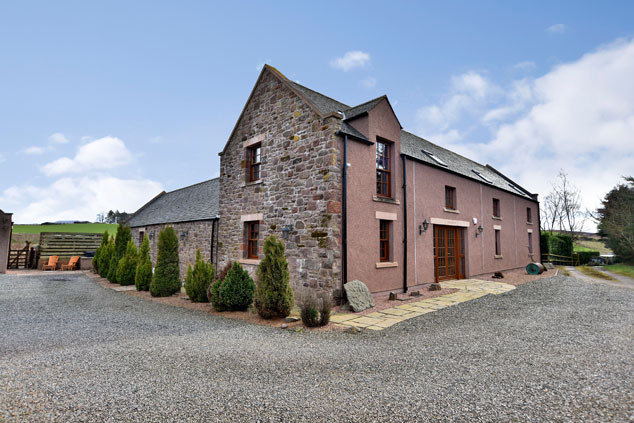 Laurencekirk is an old market town in the heart of the 'Howe o' the Mearns' valley lying approximately 13 miles south of Stonehaven and is well served by local shops, hotels and a healthcare centre. Primary and secondary schooling are both available within the town. Laurencekirk's railway station allows for easy commuting to both the north and the south, while the A90 brings nearby towns and cities such as Montrose, Brechin and Dundee into easy reach. Entrance Vestibule: From the driveway, a stone paved area leads to a set of lovely wooden French doors suitable for disabled access with glass panelling to the side which give access to the entrance vestibule. Solid oak flooring which continues into the reception hall which is accessed via a further set of similar style French doors. Reception Hall: 17’10” x 11’9” [5.43m x 3.59m] approx. at widest. 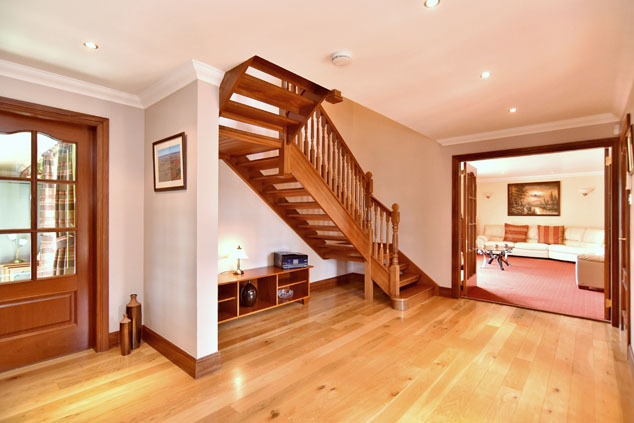 This is a lovely spacious hall featuring a solid oak open tread staircase with wooden balustrade leading to the upper floor. There is a large walk-in cupboard housing the electric meter with hanging and shelving space. A large set of wooden French doors leads through to the lounge. 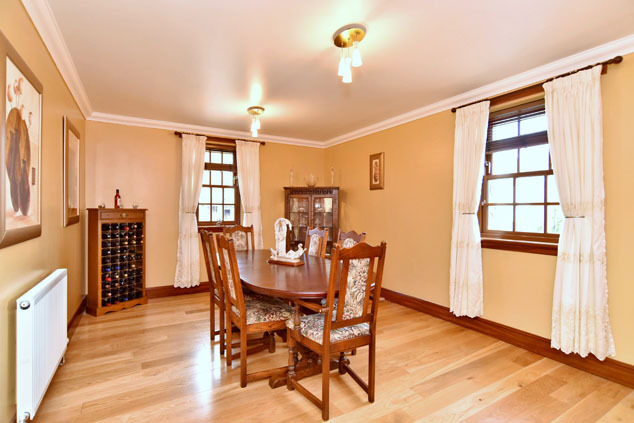 The dining room/double bedroom, cloakroom and kitchen are also accessed via the hall. Telephone point. Lounge: 20’7” x 17’2” [6.27m x 5.23m] approx. 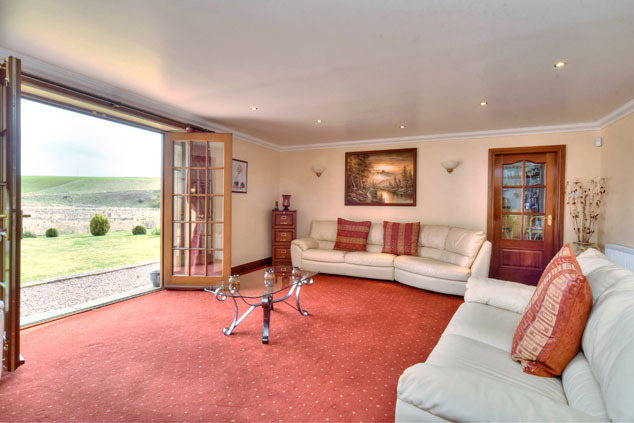 This is an exceptionally spacious carpeted dual aspect room benefitting from a wide set of wooden French doors with side glass panelling which lead onto the rear pebbled patio area and from which the lovely countryside views can be appreciated. There is a further sliding sash effect window to the front. Telephone point. Snug/Bar: 17’2” x 13’1” [5.23m x 3.99m] approx. 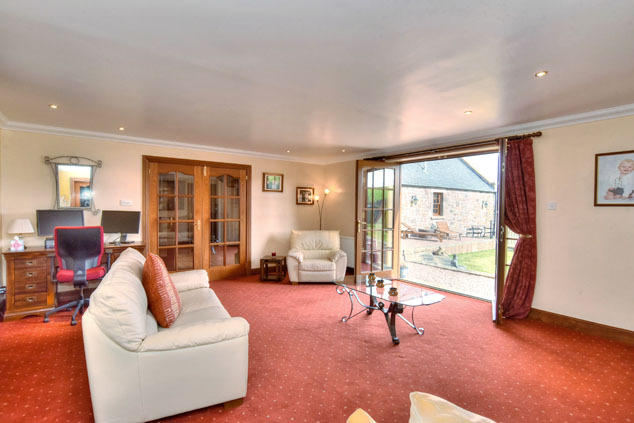 Accessed via a wooden glass panelled door from the lounge, this is a well proportioned room boasting another set of wide wooden French doors with side glass panelling leading to the rear pebbled patio area from which the lovely views can also be enjoyed. There is also a sliding sash effect window to the front and solid oak flooring. TV point. Telephone point. Bedroom 1/Dining Room: 17’1” x 11’5” [5.21m x 3.48m] approx. Accessed from the hall, this double room is currently furnished as a dining room but could easily be utilised as a double bedroom with the benefit of a wheelchair friendly cloakroom next door to it. It has solid oak flooring and features dual aspect sliding sash effect windows to the front and side driveway. 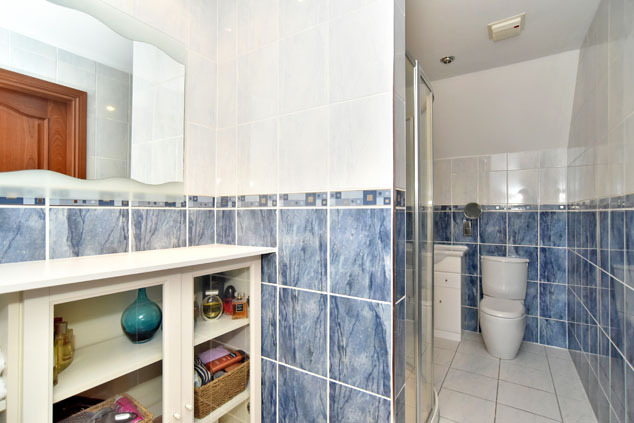 Cloakroom: Also accessed from the hall, and fitted with a modern white w.c. and wash hand basin built into a corner vanity unit with tiled splashback. 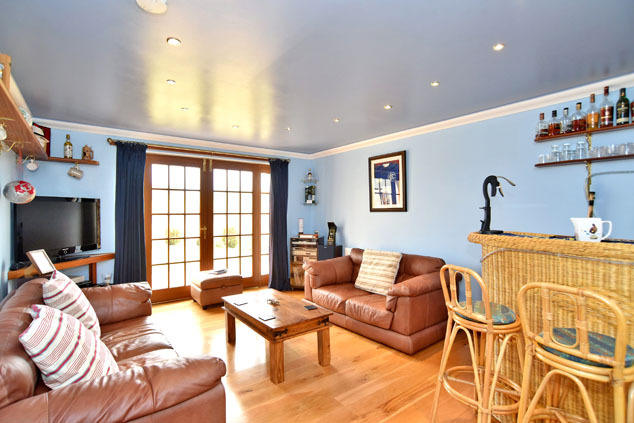 There is a lovely floor to ceiling window to the front and solid oak flooring. Chrome radiator. Extractor fan. Kitchen/Dining/Family Room: 26’5” x 16’8” [8.06m x 5.07m] approx. 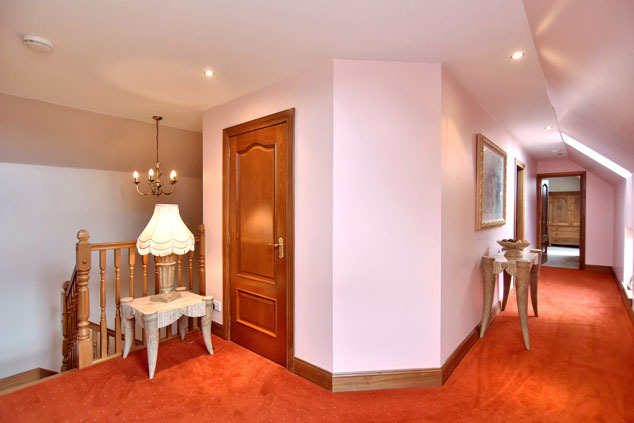 This is a beautiful room accessed via the hall through a wooden door with glass panelling. 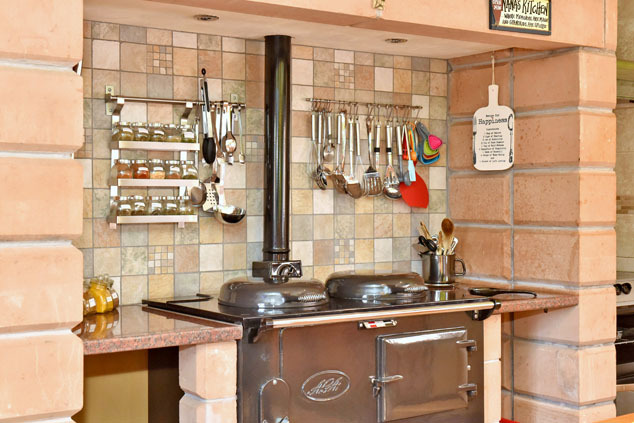 The eye cannot help but be drawn to the fully operational AGA cooker built into a large traditional stone surround at the rear which adds charm to the room. 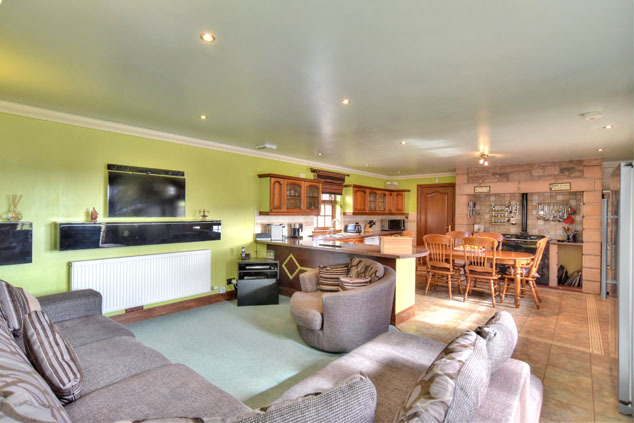 There is a large breakfast bar area and ample wooden wall and base units with granite worktops and tiled splashback. There is an integrated 1.5 stainless steel sink and drainer with chrome mixer tap and dishwasher. The free standing electric oven and double Samsung fridge/freezer will also remain. The whole kitchen area is floored with Karndean flooring and plumbing is available for a central island if desired. A carpeted area opposite the breakfast bar provides ample space for dining furniture or seating. There is a set of wide wooden French doors giving access to a flagstone patio area at the rear and there are further sliding sash effect windows to the rear and side allowing plenty of natural light. TV point. Telephone point. Utility Room: 16’7” x 9’9” [5.05m x 2.97m] approx. at widest. Karndean flooring continues through to the useful utility area. There are further wooden wall and base units with tiled splashbacks which incorporate a round stainless steel sink with mixer tap. One washing machine will remain and there is plumbing available for another. The boiler is located under a base unit. There is a built-in double wooden fronted wardrobe with ample hanging space and shelving providing excellent storage. There is a sliding sash effect window overlooking the rear and a wooden door with opaque glazed panel to the driveway. A wooden door gives access to the gymnasium/double bedroom two. Double Bedroom 2/Gymnasium: 16’8” x 14’0” [5.07m x 4.26m] approx. at widest. 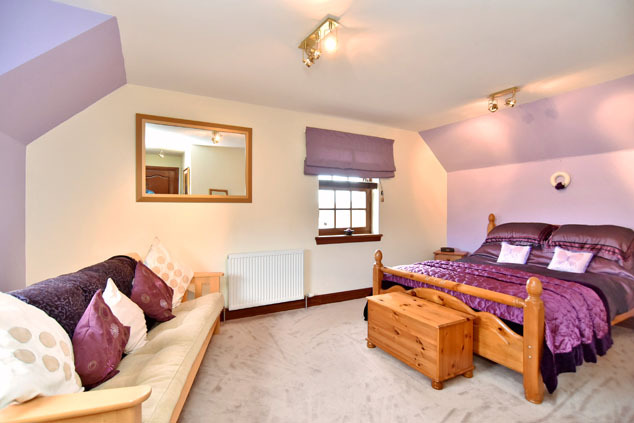 Currently used as a gymnasium this room has solid wood flooring and sliding sash effect window overlooking the rear with lovely countryside views giving it the versatility to become a bedroom if desired. A ceiling hatch with Ramsay ladder gives access to the fully floored loft which houses a large water tank and is currently used as an office and additional wardrobe space. A wooden door leads into the en suite shower room. Telephone point. 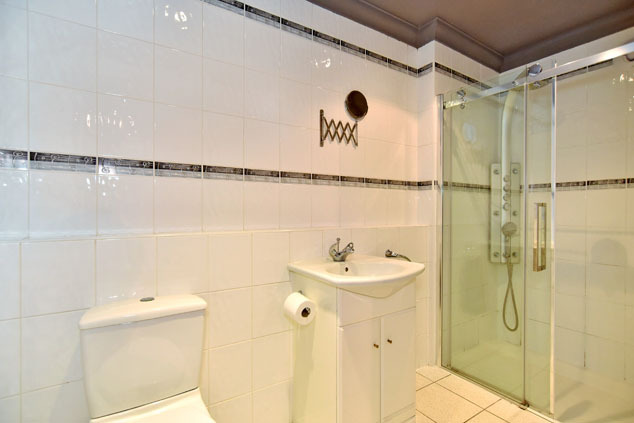 En Suite Shower Room: 10’4” x 4’7” [3.15m x 1.40m] approx. 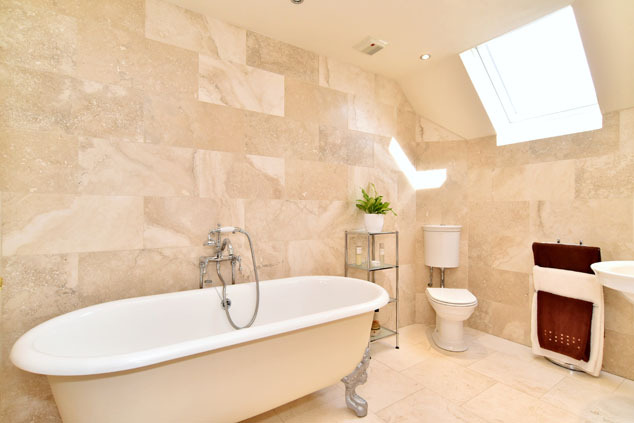 Fitted with a modern white three piece suite including a w.c., wash hand basin with built-in vanity unit and large walk-in shower cubicle with mains multi-function shower. Fully tiled walls and flooring. Extractor fan. Upper Landing: 29’1” x 17’1” [8.87m x 5.21m] approx. at widest. The carpeted upper landing is ‘L’ shaped with the spacious main area giving access to bedroom three, the family bathroom and a useful walk-in cupboard with shelving and ceiling hatch to additional loft. There are two velux windows and two sliding sash effect windows to the front giving plenty of natural light. The landing continues along a passageway which provides access to the remaining two bedrooms. Double Bedroom 3: 17’10” x 17’2” [5.43m x 5.23m] approx. at widest. A good sized carpeted double bedroom with dual aspect sliding sash effect windows to the front and side. Built-in double wooden door wardrobe with ample hanging and shelving space. Family Bathroom: 11’0” x 6’9” [3.36m x 2.05m] approx. Tastefully decorated bathroom with beautiful white roll top cast iron bath, w.c. and pedestal sink with chrome mixer tap. Fully tiled floor and partial tiling to the walls. Velux window to the rear. Double Bedroom 4: 12’7” x 11’7” [3.83m x 3.53m] approx. Well proportioned carpeted double bedroom with sliding sash effect window to the rear and benefitting from built-in double wooden door wardrobe with hanging and shelving. Wooden door to en suite shower room. 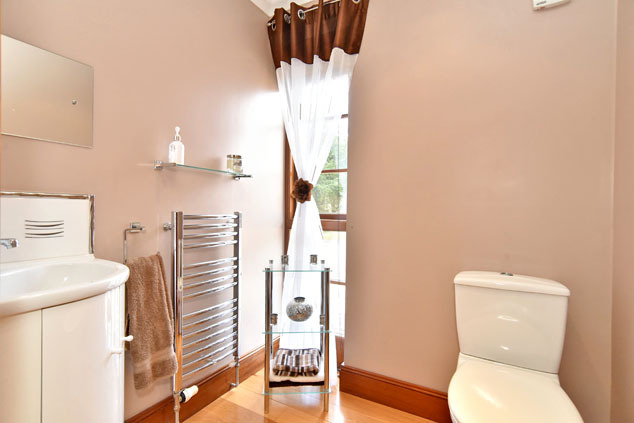 En Suite Shower Room: 12’6” x 5’2” [3.82m x 1.57m] approx. 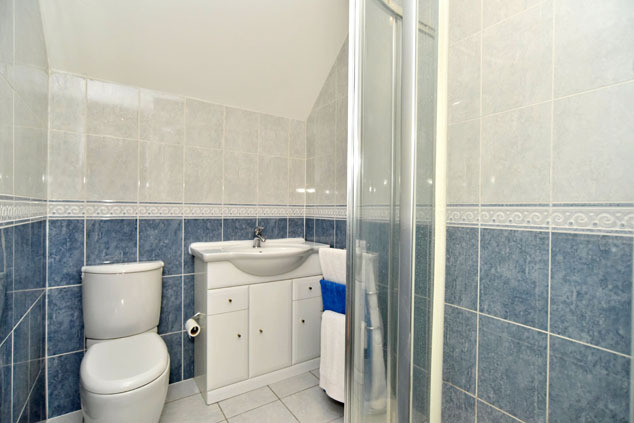 Attractive good sized en suite with fully tiled walls and flooring. There is a built-in shelving unit with tiled partition wall. To the other side of this is a corner shower cubicle with Mira shower, w.c. and wash hand basin set within a vanity unit. Ceiling fan. Double Bedroom 5: 17’2” x 16’5” [5.23m x 5.01m] approx. A further spacious carpeted double bedroom with the benefit of dual aspect sliding sash effect windows to the rear and side and additional velux window. A wooden door leads into the en suite shower room. TV point. En Suite Shower Room: 12’6” x 5’6” [3.82m x 1.67m] approx. Almost a mirror image of the previous shower room, this has a large corner shower cubicle with Mira shower and is also fully tiled with a w.c., wash hand basin set within a vanity unit, tiled partition wall and built-in shelving unit. Ceiling fan. Detached Double Garage: Situated at the end of the driveway to the side of property, the garage benefits from two electric up and over wooden doors, a large inspection pit and ramp leading into the rear garden ideal for accommodating a sit on mower. It is fully alarmed and has a ceiling hatch with Ramsay ladder leading to its own fully insulated and floored loft with power. Wooden door with opaque glass panel to the side and window to the rear. Solar roof panels. Outside: There are extensive enclosed landscaped gardens to the rear and side of the house featuring a beautiful flagstone patio area bordered by a wrought iron balustrade is accessible via the kitchen/dining room. A further pebbled patio area is accessible from the snug/bar along with a large expansive lawn with clever use of conifer hedging provide additional sheltered areas. An embankment with ornamental shrubs leads down to a stream belonging to the property and there are lovely views over the fields and countryside beyond. 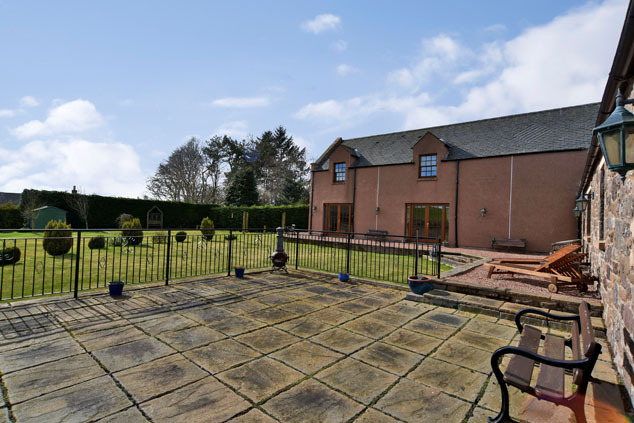 Situated to the side of the garage and beyond is a further area of lawn with conifer hedging, a drying green, a vegetable patch and greenhouse surrounded by a brick wall and a superb secluded decked area surrounded by wooden fencing with a multi-featured covered hot tub. There is the added benefit of a wooden shed built alongside. To the rear of the vegetable patch is a grand master storage shed and green trailer storage shed. 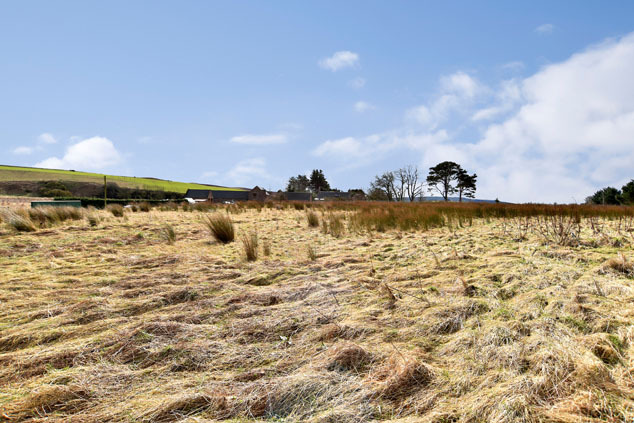 There are two roads which lead to the property, one owned by the neighbouring property over which is there is a right of access and another belonging exclusively to Mogi’s Byre which leads passed its own field which extends to 1.40 acres approx. A traditional flagstone path surrounds part of the house and there is also ample outside lighting. A further feature is to the roof which has slates laid in the traditional diamond cut format. Directions: Travelling south on the A90 dual carriageway going past the petrol station at Fiddes and take the second left after about one mile which is marked for Pitskelly. Take the first sharp left road and follow it until you arrive at the property, as indicated by our for sale board. Notes: Oil central heating and solar panel heating. Full double glazing. EPC=D. All carpets, Karndean flooring and solid oak flooring, light fittings, blinds and curtains are included. The washing machine, dishwasher, electric oven, AGA cooker and double Samsung free standing fridge/freezer will remain along with the security cameras, alarm system and security safe. Outside, the hot tub, wooden shed, greenhouse, grand master storage shed, green trailer storage shed and wooden shed in the rear garden are also included along with the solid wooden children’s swing and wooden hammock posts.